Early this month Apple created a huge buzz not for their self-claimed revolutionary phone but killing the headphone jack when it released iPhone7. The iPhone 7 hints at what’s to come to the rest of the smartphone lineup, and potentially even other Apple products. To alleviate the change, Apple has included in the iPhone 7 package a Lightning port-to-headphone jack adapter, and a pair of ear buds that plug into the charging port. Although they tried their level best to bring the changes but it didn’t work as they have excepted. It was only a matter of time until iPhone7 accessory makers started delivering a slew of cases to bring back the 3.5mm headphone jack. But I didn’t expect the first case that you could actually pre order — Fuze — would come from a tiny Austin outfits In die gogo campaign. The company making the Fuze case, allows it to plug right into your iPhone 7 to offer extended battery life, much like what you’d find from Mophie, or Apple’s own battery case. The difference lies in the bottom of the Fuze case. 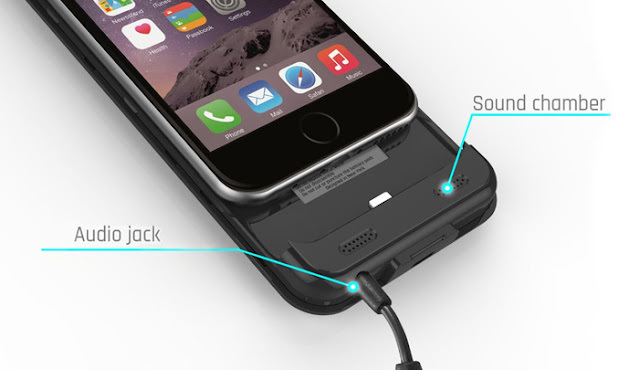 A Lightning charging port can be found on the outside of the case, as well as a 3.5mm headphone jack. The Fuze case isn’t the first accessory to split charging from listening to audio. Apple’s iPhone 7 Lightning dock offers inputs for both a charging cable and a 3.5mm headphone jack–which means we could see more case manufacturers do the same. Fuze could be the first of many iPhone 7 cases to cleverly split audio and charging. The benefits of which are obvious: being able to charge the device and listen to audio at the same time is a feature that’s sorely lacking from the current iPhone 7 offering. The Fuze case also creates one less reason to cart along, and potentially lose, the included headphone adapter dongle. Current Mophie cases and other battery options fit for older iPhones offer a cutout for the headphone jack. But we could see more charging cases, which already plug into the iPhone’s charging slot,offer a proper headphone jack built right in. Until then, users will have to rely on this crowd funding campaign to save their inner-audiophile. While no price has been announced for the case, those who pledge $59 will definitely get the case when shipments start in December. Pledging $89 will get you two cases, $249 for four cases, etc. With fundraising ending in a month, we’ll know soon whether the first prominent headphone jack-supporting case will be provided by Actual Innovation.